Are you a 4-H alumni? I was a member of Atlantic County, NJ 4-H for approximately 11 years. Throughout those years, I was a member of Country Critters Rabbit, Cavy, Small animal & Herpetology Club, K-9ers Dog Obedience Club, and Youth Council. I have been volunteering for the past 13 years in Atlantic County and now Cape May County 4-H. My daughter is now in 4-H as well, and I love that I can help the next generation. As a full time keeper, we work an 8 hour shift, 5 days a week with set days off. In the morning we check in with our coworkers, read the daily reports from the previous day’s sections, get our radios, and head to our scheduled areas. In some areas, we have diets and medications to prep first thing in the morning. I am an African Savanna keeper, so myself and my coworker drive our John Deere Gators to each barn to check on our animals (Giraffe & Ostrich, Zebras & Bongos, and Ankole Cattle & Scimitar-horned Oryx). After all animals are checked on, we split up and clean the yards and put fresh grain and/or hay out. The enrichment for the animals will occasionally be put out in their yard as well. Animals get shifted back out and then their barn stalls are cleaned. More enrichment, feed and hay are set up for the animals when they are brought back in for the evening. It’s a full day of cleaning and feeding. In the afternoon, we have to restock supplies as needed, i.e. timothy or alfalfa hay, straw, pine shaving bags, grain or cleaning supplies. We also do our training with the giraffe in the afternoon. We have to help close up the zoo at 3:30 pm, once the zoo is secure, we go to our headquarters and write our daily report of all meds given or medical issues, diet changes, enrichment given, training, and projects done. I get to work with some amazing animals, many that are endangered in the wild. I’ve experienced several births, including 3 giraffe births, and unfortunately many deaths. I have gotten to attend several national zookeeper conferences and workshops, most recently a week full of learning about giraffes. I couldn’t imagine doing anything else. The pride my 2 children have for what I do is one of the best feelings. My daughter tells everyone that she wants to be a zookeeper like her mom when she grows up. Being a zookeeper, there are several challenges. It’s a very stressful job, we have to ensure all gates, doors, and locks are secure. If an animal escapes, it could be deadly to a person or the animal. That is our number one rule – to always double check all of our locks and to know where every animal is at all times. We have seasonal challenges as well, working daily outside in extreme heat and cold, rain, or snow. We also have a very physical job, requiring us to lift 50 lbs at a time, sometimes more, throughout the day. We occasionally face challenges with our animals, including training them new behaviors and shifting them. What is your favorite science class in school and why? In college, I had multiple science classes a semester. I had several favorites including ornithology, ecology, animal anatomy and physiology, all my wildlife management courses, and the farm animal courses. I enjoyed the labs and field trips with the hands-on learning. We even got to work on the farms at college with the horses, cattle, pigs, and sheep. Can you share advice for someone who is interested in joining your profession? Attending a college that offers hands-on learning is the ideal. I interned at the Philadelphia Zoo in college, which was when I decided this was what I wanted to do with my life. After I interned, I volunteered in their education department until they hired me part-time while I was in college. Immediately after I graduated from college, I was able to get an education job at Cape May County Zoo, it wasn’t exactly what I wanted, but it got my foot in the door. After 6 months as education, I was able to move departments into the zoo and become a zookeeper. 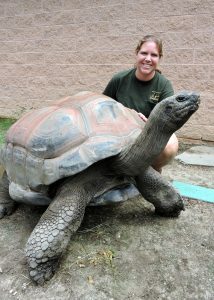 I am a national member of the American Association of Zookeepers (‘AAZK’ www.aazk.org), and our zoo chapter’s treasurer. I am also a professional member of the Association of Zoos and Aquariums (‘AZA’ www.aza.org). These are both great organizations to be a member of, they provide monthly magazines with excellent information and also have great online resources for members. This field is very competitive and can be difficult to get a starting job due to lack of experience. Internships or volunteering is a great way to gain experience and see if this is what you want to do. Any experience is a good experience and helps build your resume for the next job opportunity. Which of the following activities can help youth develop the specific skilled needed for your career? –Cook by following a recipe – we prepare special diets and medications that have specific directions like recipes. –Wildlife observation – very important to have great observation skills when working with animals!